Branislava Šandrih, from the University of Belgrade, has spent a week with us at RGCL. During this time, she has formed collaborations with many members of the group. 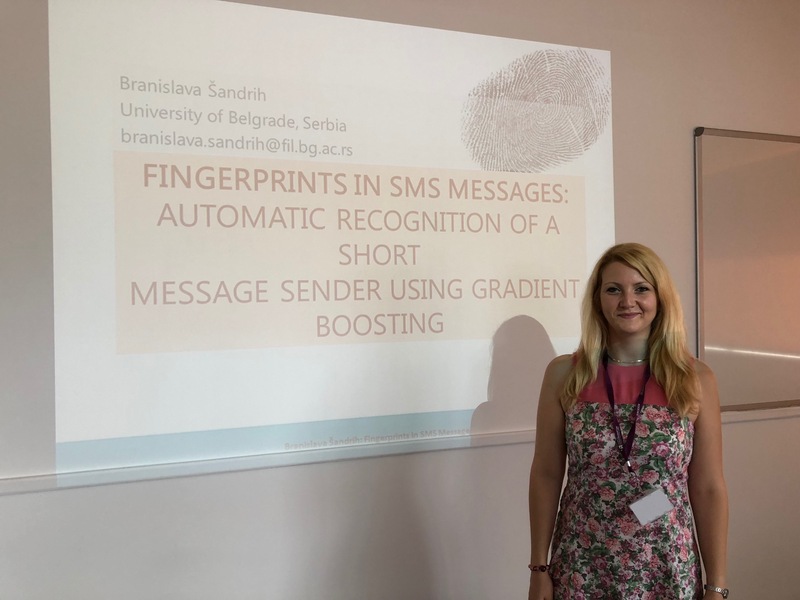 Branislava gave a talk to the group which outlined her research. Is it possible to tell who is the sender of the short message only by analysing a distribution of characters, and not the meaning of the content itself? If possible, how reliable would the judgment be? Are we leaving some kind of ‘fingerprints’ when we text, and can we tell anything about a person based on the way this person writes short messages? A multilingual corpus of SMS messages was collected from a single smart phone to underpin the development of a methodology to address the above challenges. First, a binary classifier was trained to distinguish between messages composed and sent by a public service (e.g. parking service, bank reports etc.) and messages written by humans. A second classifier caters for the more challenging task of distinguishing between messages written by the owner of the smart phone and messages sent by other senders. Branislava’s presentation outlined the experiments related to the above classifiers and reported the evaluation results. This entry was posted in Seminars 2018 on August 2, 2018 by riilp. We will all be very sorry to say goodbye to Larissa when she soon returns to Universidade Federal de Minas Gerais (UFMG) in Brazil. 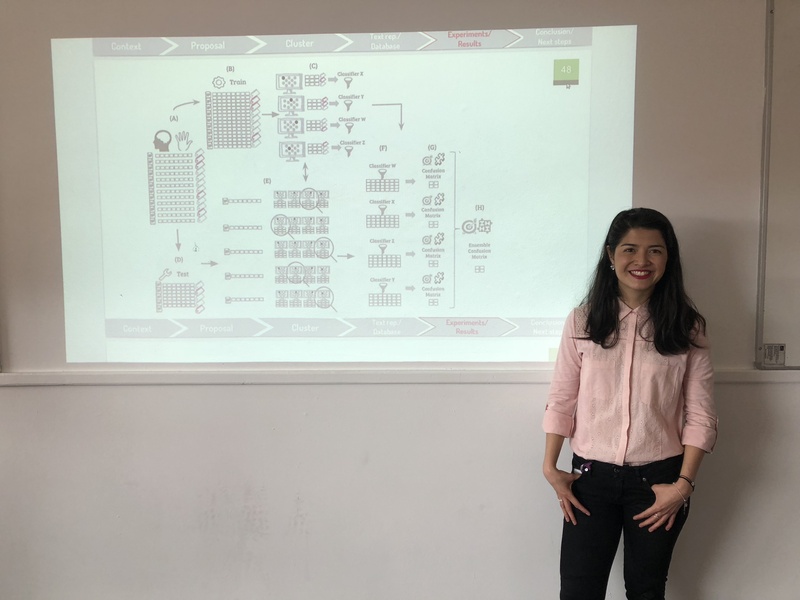 This week, Larissa gave the group a talk which outlined her research and the work she has been doing in Wolverhampton for the past year. Abstract: This work describes the classification of texts as being either crime-related or non crime-related. Given the spontaneity and popularity of Twitter we collected some posts related with crime and criminology, in the state of São Paulo-SP Brazil. However, this data set is not a collection of crime reports. As the web language is characterized by diversity including flexibility, spontaneity and informality we need a classification rule to filter the documents which really are in the context. The proposed methodology works in a two step framework. In the first step we partition the text database into smaller data sets which define text collections with characteristics (not necessarily directly observable) which allow a better classification process. This enables the usage of parallel computing which decreases the time process required for the technique execution. Later on each subset of the data induces a distinct classification rule with a Supervised Machine Learning technique. For the sake of simplicity we work with KMeans and KMedoids and linear SVM. We will present our results in terms of speed and classification accuracy using various feature sets, including semantic codes. This entry was posted in Seminars 2018 on July 20, 2018 by riilp. 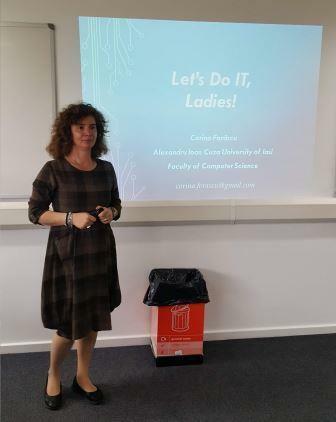 The seminar was attended by colleagues across the University and there was an engaged discussion after Corina’s talk – perhaps the start of fledgling ‘Women in Science Network’ at Wolverhampton? Abstract: Let’s do IT, ladies! Nowadays, with the existing disparity between men and women in IT, there are many initiatives aiming to bridge this gap. The speaker will introduce the main groups and activities related to women in IT, Computer Science and related fields. She will present current openings dedicated to them, like conferences or contests. Based on the initiatives and events organized within the Women in Information Technology of Iasi, the speaker will suggest steps that could be taken by a similar group in University of Wolverhampton. This entry was posted in Seminars, Seminars 2018 on June 6, 2018 by riilp. 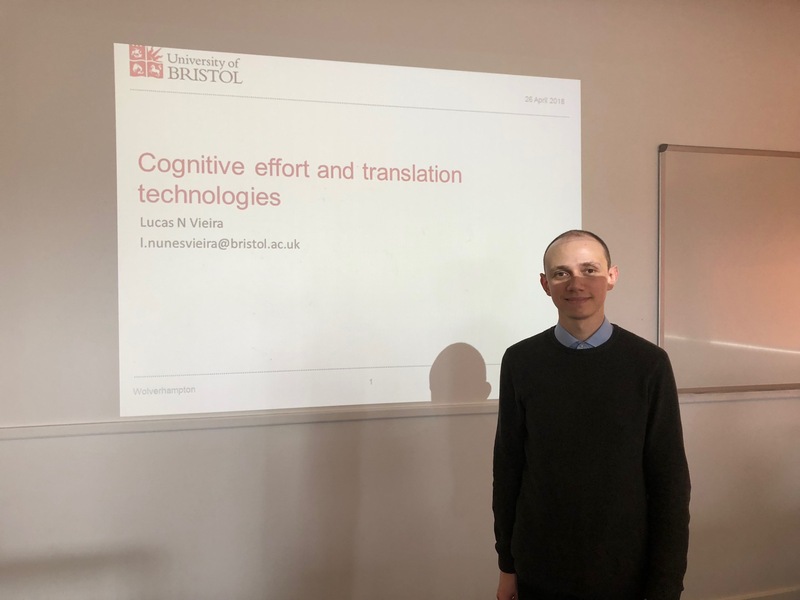 Last week, Dr Lucas Vieira from the University of Bristol visited RGCL and gave a seminar as part of the MA Computational Linguistics. Dr Vieira’s talk was well received by the MA students and attended by members of the Research Group. Measuring the level of effort required by translation tasks has several applications in academia and industry, including understanding what goes on in translators’ minds and being able to predict effort when planning and managing translation projects. Effort is therefore a frequently researched topic in translation, but measuring cognitive (or mental) effort is not straightforward. This talk will examine the implications of using different data sources to estimate cognitive effort. First, it will present results of a study where a multivariate analysis was used to investigate the relationship between different measures of cognitive effort in post-editing of machine translation, including eye-movement metrics, pauses, and subjective ratings. It will then provide preliminary results of a second study where eye tracking was used to observe trainee translators’ first-ever interaction with computer-assisted translation tools. The talk will show how mouse clicks can be used to complement eye-movement data in translation research and will argue that care should be taken in choosing appropriate measures of effort depending on the study questions and the sample size. Although different measures of cognitive effort are, as expected, often found to be correlated, it was observed that these measures can be clustered together in different groups, which has implications for research and for how the concept of cognitive effort is formulated and understood. This entry was posted in Seminars, Seminars 2018 on May 9, 2018 by riilp. Last week RGCL welcomed Dr Aline Villavicencio from the University of Essex (UK) and the Federal University of Rio Grande do Sul (Brazil). 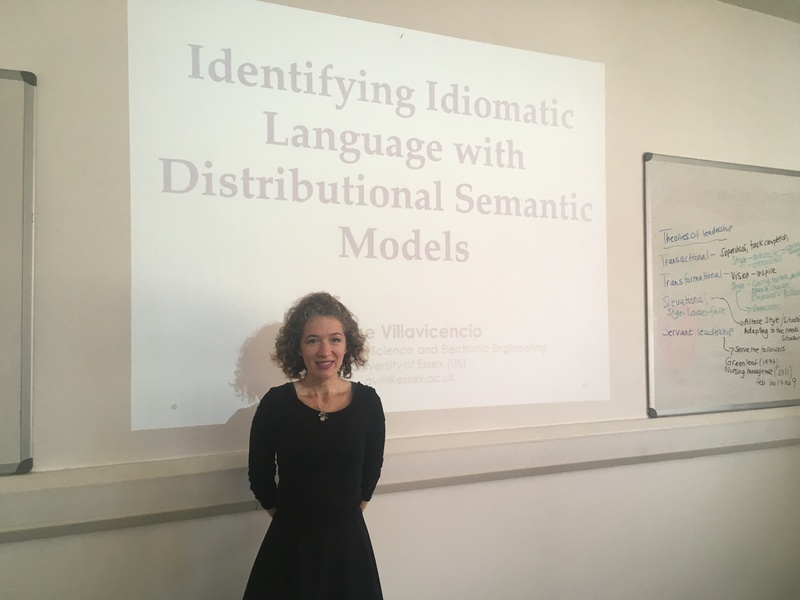 Dr Villavicencio gave a Research Seminar, which was well attended and an interesting discussion after. Upcoming Seminars can be found on our website here. This entry was posted in Seminars, Seminars 2018 on April 24, 2018 by riilp. RGCL welcomed visitors Matthias Schlögl and Katalin Eszter Lejtovicz from the Austrian Centre for Digital Humanities earlier this week. 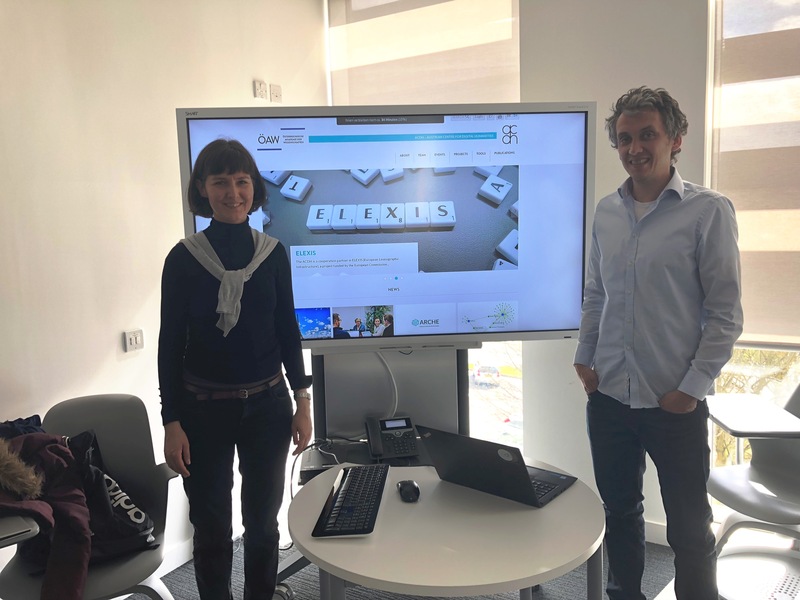 Whilst they were here Matthias and Katalin presented their current research to the group, the seminar was well received and there was an interesting discussion. The Austrian Centre for Digital Humanities (ACDH) of the Austrian Academy of Sciences is a research institute which was set up with the declared intention of fostering the humanities by applying digital methods and tools in a wide range of academic fields. It offers a growing portfolio of services running a repository for digital language resources, hosting and publishing data, developing software and working on establishing a tightly knit network of specialised knowledge centres by offering advice and guidance to the research community. In his presentation Matthias Schlögl will concentrate on the APIS project. APIS ultimate goal is the semantic enrichment of the roughly 18.000 biographies published so far in the Austrian Biographic Dictionary (ÖBL). In the course of the project a Virtual Research Environment (VRE) was developed that allows researchers to annotate biographies, link entities to reference resources and visualize/export the results. Data generated in the VRE is used to train/evaluate Natural Language Processing (NLP) tools that also store annotations to the VRE (where in return they can be reviewed by researchers). Matthias will also show some NLP related tools (e.g. a webbased tool to re-train named entity recognition models (NER)) that are in use/development at the ACDH to foster digital humanities projects like APIS. In her presentation Katalin Eszter Lejtovicz will present the APIS project aims to extract information from unstructured biographical documents by means of detecting Named Entities, linking them to Linked Open Data vocabularies and finding relations between the entities. The presentation will give an introduction to the steps of information extraction in APIS, give a brief overview of the tools/resources that are used in the project and the ones we have been experimenting with. To name a few: Apache Stanbol for Entity Linking, IEPY, GATE for relation extraction, GermaNet, Wikidata for disambiguation. This entry was posted in Seminars, Seminars 2018 on April 19, 2018 by riilp.